I’m kind of a on cauliflower kick right now. I made cauliflower garlic potatoes for Thanksgiving, which are always a hit, cauliflower Mac n Cheese (that recipe still needs a little more work), and a few months ago I saw cauliflower popcorn on a menu and I’ve been dying to find an easy, simple recipe to try out ever since. Before I divulge how to make this fun little snack, I want to say a few things about this great white versatile vegetable that looks like our brain. Cauliflower is part of the cruciferous family which is a particularly good class of vegetables because of the sulfur component that they contribute to us. Why do we care about getting sulfur? Well, sulfur is a precursor to a very powerful antioxidant that our own body makes. Antioxidants are the good guys that gobble up the bad guys like cancer cells. The sulfur from cruciferous vegetables boosts our liver’s ability to detoxify which helps to keep a clear, well operating brain. Cruciferous vegetables also help to regulate excess estrogen in both men and women which is very important in keeping prostate and breast tissue healthy. I hope you will try out this fun little snack below and bring more cauliflower into you and your family’s life! Add cornmeal, salt and shake again to evenly distribute cornmeal. 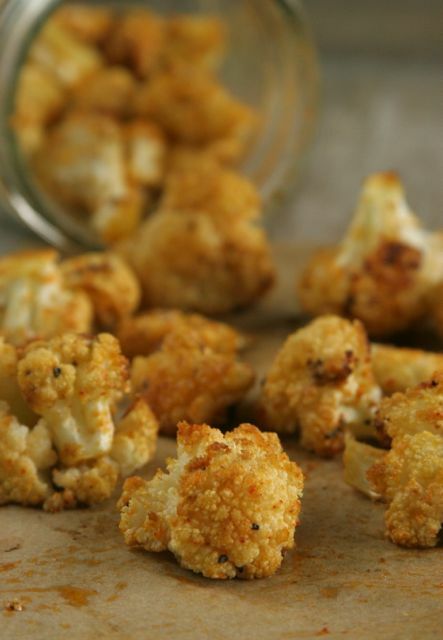 Bake in preheated oven 35-40 minutes, until cauliflower is golden brown.